We are all for multifunctional furniture like our Amish Mission Console End Table. This mission-style end table is also a curio cabinet! Display mementos, trinkets, or collectibles on the three glass shelves located behind the glass door with mullions. Two glass sides with mullions, a glass top, and a mirror back provide unobstructed views of the items you choose to display. 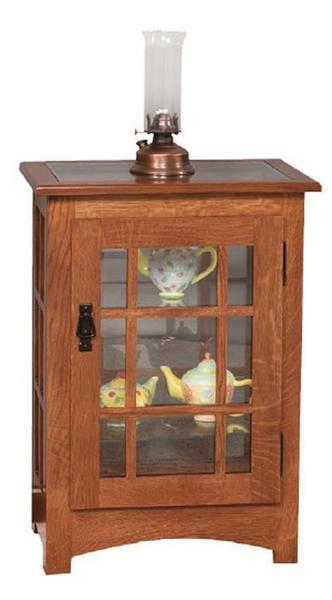 The solid wood frame is built standard with and gently arching base in te front. This display end table can be made from your choice of wood type, finish, and hardware.